What will I learn on the Assertive PA? This Assertive PA course involves building up your self-esteem and sense of self-worth so that you see yourself not just as the assistant to an important person but as an extension of that person’s management style and vision. As a PA, you ‘plough a lonely furrow’ at times. Your position is unique: you work closely with and have the ear of someone important and influential, yet you occupy a relatively junior place in the hierarchy. The orbit in which you move makes colleagues keep their distance and be on their guard about what they say in your presence in case it gets back to your manager, possibly to their detriment. So it’s hard to establish the friendly interpersonal relationships that allow office workers to work effectively together. It’s a bit like being a royal consort – all the glory, but no power. Sometimes, however, you need some of that power to rub off on you, because today’s senior executive expects you to be able to act as a proxy and delegate accordingly. However you became a PA – and it’s surprising just how many PAs tell us it happened to them almost by accident – your position is unusual in many ways. No other role in business places so much reliance on the absolute capability of one person to provide unwavering and comprehensive support to a senior executive. Working in the shadow of someone important and busy, it’s easy for your own needs and aspirations to be overlooked – by you and others. This Assertive PA course brings you out of the shadows and into the light as you become aware of the critical part you play in your organisation’s success – and how you can give your career a boost as well. We give you the knowledge and tools to ensure you become the indispensable aide and business associate your manager needs – so much more than a secretary. We also make sure you begin to appreciate your real worth – not just to your manager and yourself, but to the whole organisation – and arm you with the confidence and assertiveness necessary to be not just good at your job, but brilliant at it. The rewards for this fresh, new approach to your role and the enhanced outlook on your career and life that it delivers will quickly become apparent in the weeks and months following the Assertive PA course. You are the gatekeeper to your manager, but who protects you from the interruptions that conspire to prevent you achieving what needs to be done each day? It’s tough enough working for someone who never seems to go home, without missing your lunch break or only occasionally getting out of the office on time. Our research suggests that PAs frequently experience interruptions totalling 90 minutes or more a day. Think what you could achieve and how much better you would feel if you could claw back two hours of lost time each day. Sounds impossible? During this Assertive PA course, we will show you how it can be done. And you will love us for it. Protecting your manager from unnecessary interruptions is a critical part of your job and it’s one of the hardest, especially when there’s a steady stream of other, often very senior, people wanting opinions and decisions. We will show you how to handle these tricky encounters, diplomatically but firmly, whilst ensuring that you don’t create a bottleneck that threatens the success of the organisation. As your reputation for decisive action grows, people seeking your manager’s time will start to think harder and more thoroughly before doing so and will even begin bouncing their thoughts off you first. You will become a kind of executive ‘triage nurse’, deciding which ideas and requests really merit the attention of your manager and which can be delegated sideways or downwards to someone more appropriate. Few people in business have to juggle as many different balls as a busy PA, which can be very stressful, especially if you work for more than one manager. On this day, we will show you a number of different strategies you can try in order to reduce this stress. These include managing your and your manager’s time more effectively and learning how, with tactful firmness, to deflect or defer tasks or priority interruptions that often turn out to be little more than fire-fighting activities. Working for one demanding and exacting manager can be more than enough for most PAs, so if you work for two or more, you have our sympathy. But balancing their individual needs doesn’t need to be hell. Plainly you cannot give them the same level of attention they would get if they didn’t have to share you, but there is a better way. We will show you how it works and equip you with the tools and skills – and the patience – you need to make a great job of keeping them all happy and successful – and whilst keeping your stress levels down. Your unique position as a PA means you often hear things that challenge your sense of discretion. Does your boss need to know about all of them, or do you decide what to pass on a ‘need to know’ basis? Do you remain as enigmatic as the Sphinx, or behave like a C-list celebrity on a reality TV show? We’re exaggerating a bit here, but the purpose is serious: winning the confidence of colleagues at all levels is vital if you are to function effectively and successfully. A reputation for utter discretion, except where to keep silent might threaten the organisation or your manager, will open new conduits of communication and information that will help make your job easier and give you the opportunity to present your manager with new business options to consider. No-one likes time management courses, except the people who send you on them. PAs know that time management courses are for people who haven’t got enough to do, so we’re not going to give you one of those. But because this course has been designed by PAs for PAs, there are some very useful tips and wrinkles we can pass on to help you manage not just your time, but your manager’s time, more effectively and productively. One thing we will do before you attend this course is ask you to keep a log of your daily activity, so we can analyse it with you during the course. All Today’s PA delegates are asked to evaluate the Assertive PA course as it finishes. Delegates regularly give us 5 out of 5, and 1 in 6 have said it’s the best course they’ve ever attended. 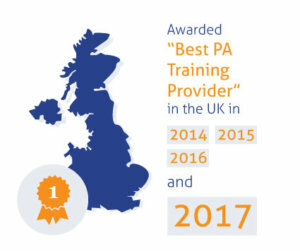 Today’s PA was named “Best PA Training Provider in the UK” four years running, having been voted for by thousands of PAs in the pa-assist.com Members’ Voice Awards 2014, 2015, 2016 and 2017. Your principal trainer, Paul Pennant, is the founder and Managing Director of Today’s PA. Paul started Today’s PA with a clear vision: to take his own experiences as a PA, office manager and business director and create training courses that meet the challenging real-world needs and aspirations of modern business professionals. With the rapid advances in technology, Paul has specialised in helping PAs to utilise this technology to save time and reduce stress. He covers all Microsoft Office products at all levels. He is a Microsoft Office Specialist Master. With a post-graduate degree in business studies, few, if any, trainers are better qualified to deliver and lead the Assertive PA for Today’s PAs – for you. Your investment is just £475 + VAT. Investment for non-profit organisations is £425+VAT. When you commit your valuable time to Today’s PA, we want you to know that we understand and recognise that commitment. We want to do everything we can to ensure that the Assertive PA is thoroughly worthwhile for you. Being properly prepared will play a key part in achieving that success. Indeed, your success is our success. If you get what we promise from the Assertive PA course – and we know you will – we are confident you will recommend it to peers and colleagues. So we would like you to complete a short questionnaire, just before you attend the workshop, in order to give us a snapshot of the kind of person and PA you are, how you became a PA and what are your issues, frustrations, hopes and ambitions. When you arrive at the workshop, you will feel that you are among friends who understand you – and you are because your trainers and course designers have all been where you are now. Doesn’t that give you a warm, fuzzy feeling? You may wish to have a look at this article on assertiveness from Wikipedia. You value your PA, of course, but don’t you sometimes wish she – or he – would be a bit more assertive, a bit more in tune with your needs, perhaps – without having to be prompted or asked? Do you sometimes feel that you could accomplish more for your business or organisation if your PA was able to anticipate your wishes, or come up with ideas that help meet your strategic objectives, thereby improving the effectiveness of your working relationship? Life at your level is not always easy for PAs – quite often they come into the role organically or by accident – maybe your PA started out as a secretary or office junior, for example. This isn’t necessarily the right formula for the kind of person you need by your side in today’s tough and competitive business environment. Even if your organisation is non-commercial, there are unprecedented pressures on it to deliver results and justify its existence to stakeholders. This workshop will provide your PA with the skills they need to achieve what you need and expect from them. That’s because, unlike other PA development courses, this one is designed by experienced, successful PAs, for today’s PAs. Today’s PA lead trainer has been a highly successful PA and Office Manager and is now the company’s Managing Director. With a post-graduate degree in business studies as well, the success of Today’s PA is a testimony to the fact that no trainer is better qualified to deliver and this workshop. Even if you can’t make it to one of our venues, don’t despair – why not let us come to you? experience is comparable. There are many good reasons for keeping the Assertive PA course in-house: it makes for greater efficiency and ensures everything is focussed on your organisation’s business. The course can be adapted to your organisation’s specific needs so that it perfectly aligns with its culture and values. Your PAs can also network and share their experiences of the course, thus strengthening the PA role within your organisation. I walked out feeling more confident, empowered, motivated, competent and less stressed than I have ever felt. I could not wait to get into the office. Confidence is sky high and I have used the ‘No’ word- extremely good. I meant to write to let you know that I’m putting into practice lots of the skills I learnt on your course, mostly around behaviours and I feel much more in control without upsetting anyone – so much so that I have been asked to apply for the deputy managers post (additional duties and more money). So thanks for the confidence to show them what I am made of!! I have to say that previous to going on the course I was close to looking for a new job but since I’ve come back I’ve just been enjoying it so much more. I even asked the boss for his objectives today!!! I feel much more in control and that’s what I was missing before I did the course. Mostly that was from a plain and simple lack of knowledge as to what exactly I should be doing but now that I know, there’s no stopping me! !